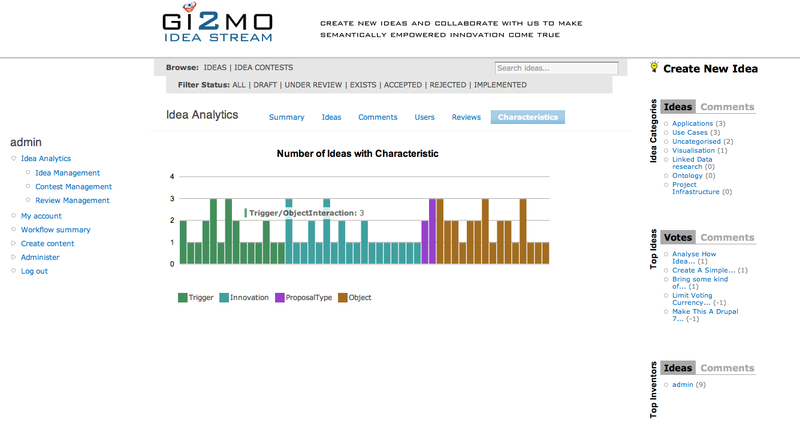 We are happy to announce a new addition to our open-source Idea Management System – IdeaStream. In fact, it’s such a grand and distinctive feature that we decided to create a new module so that administrators can choose if they actually want to install or not the new functionality. IdeaStream Analytics adds a new panel with charts and tables that summarize the activity and progress in the Idea Management System. The panel is accessible via the admin menu and it’s visibility can be fully customized via Drupal access privileges system. 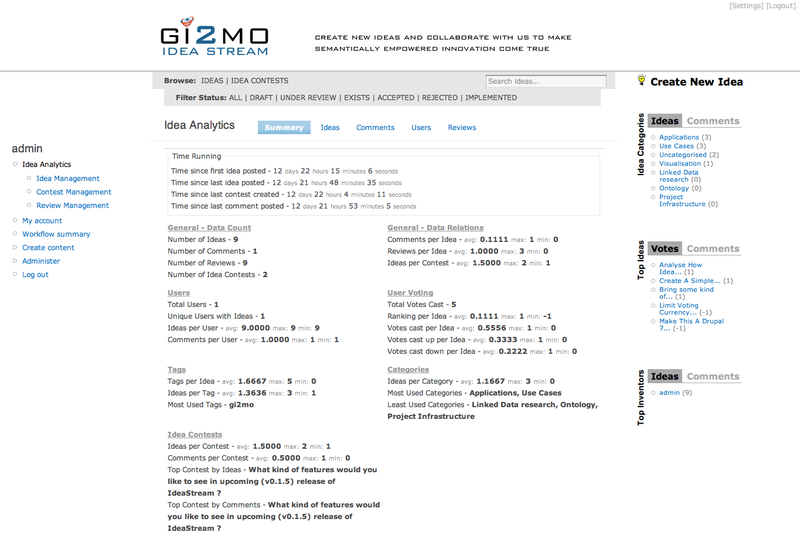 The main screen presents a summary of statistics related to ideas and other content types. Aside of the general statistics, the module brings table views for: ideas, contests and reviews. 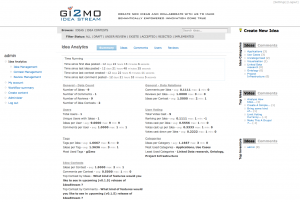 Each of those allow to browse and filter content together with its basic statistics. 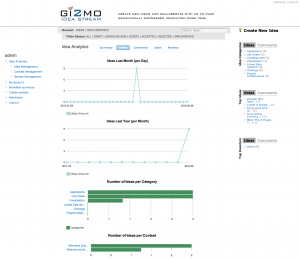 Furthermore, via designated subpanels, it is possible to view a number of statistics visualized on charts for specific content types. 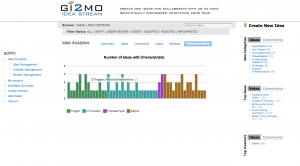 Also, as a bonus, the IdeaStream Analytics module supports our recent addition of Gi2MO Types taxonomy. Due to its’ research nature, we still did not include the taxonomy by default in IdeaStream installation. However, if the taxonomy has been installed manually (see guide) our Analytics module will detect it and provide a new tab that displays statistics on Idea Characteristics. The goal for adding this module was to demo how easily such visualisation and statistics can be added due to the open nature of Drupal. Furthermore, we still remind that additional visualisations and statistics (arguably more sophisticated) can be achieved via exporting data to RDF/XML and using external tools such as Idea Browser or Idea Analyst that we presented some time ago. 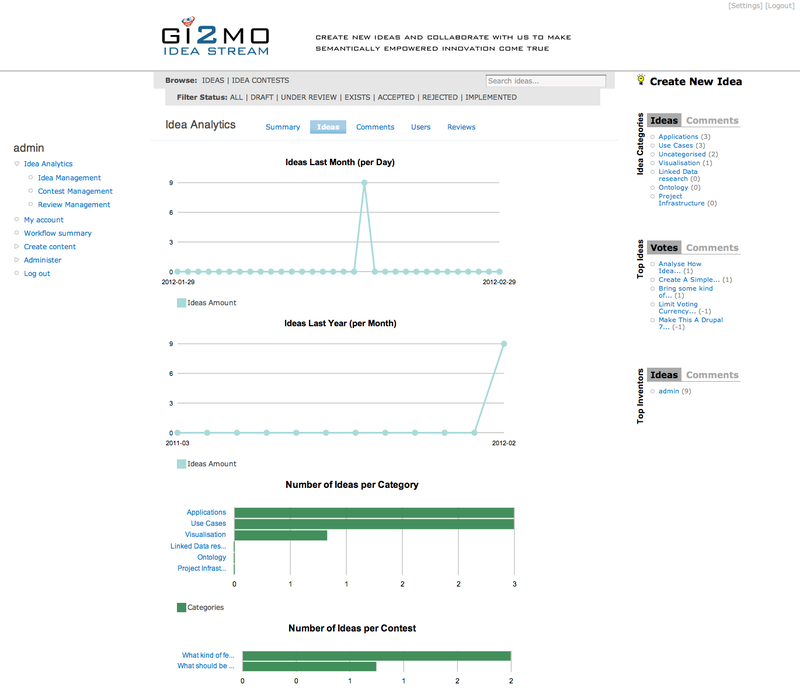 The module is recommended for use with IdeaStream v0.1.5 or newer. At the moment we distribute IdeaStream Analytics in a separate package to IdeaStream and it can be downloaded from our apps section. Before we include it the IdeaStream release bundle, we would like to hear your opinions (via mail or Gi2MO Ideas)!